Composition, Color & Concepts for Beginners. Gates studied studio art at Mira Costa College in Oceanside, California, and watercolor painting at Lane Community College in Eugene, Oregon. 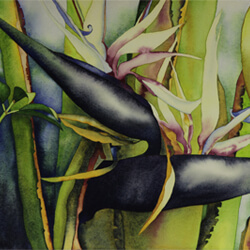 She studied watercolor with Carol Carter, Satoko Motouji, and Judy Morris. 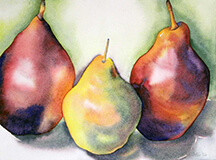 She is currently a member of the Watercolor Society of Oregon. Click for more information and to view her work. This palette of colors will allow you to mix some nice oranges, greens, purples, and grays. It has a nice mix of warm and cool tones. Palette: to put your paint on, and mix colors. I recommend a plastic folding palette. On day two we will be painting from photographs. Please bring 2-3 photographs that you would like to work from. If possible, please bring the photos in black and white as well as color. The subject matter should be something that you are inspired by, but also somewhat simple, perhaps a photo with one main subject matter, i.e. a flower, a bird, your pet, a still life, a vignette of a few objects. Visit Explore Manzanita for information about the area, lodging & dining, and more.